INDIANAPOLIS -- A busy road on Indianapolis' northeast side will close for construction this week. 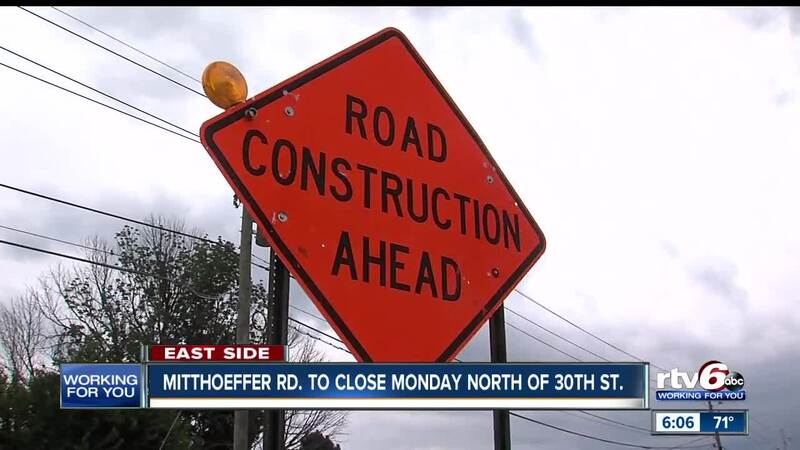 Mitthoeffer Road will close on Monday, or shortly after, just north of 30th Street. The closure is to improve a culvert under the street near 3115 N. Mitthoeffer Road. The project will also include the resurfacing of Mitthoeffer Road and the addition of a sidewalk between 30th and 38th streets, according to the Department of Public Works. Mitthoeffer Road will re-open on Aug. 3, weather permitting. Turn left and travel west on E 30th Street until reaching Post Road. Turn right on Post Road and travel north until reaching E 38th Street. Turn right on E 38th Street and travel east until reaching Mitthoeffer Road. Turn left to continue traveling northbound on Mitthoeffer Road. Turn right to travel west on E 38th Street until reaching Post Road. Turn left to travel south on Post Road until reaching E 30th Street. Turn left on E 30th Street to travel east until reaching Mitthoeffer Road. Turn right to continue traveling southbound on Mitthoeffer Road.